Immerse yourself in the Gundam universe with this set of 4 Gundam PODs. The set of 4 Japanese version PODs allows players to become Gundam pilots and take part in online battles. The Gundam POD is an arcade game set created by Bandai Namco and Banpresto, released in 2006. It is a competitive team game in which the player climbs into a POD that offers 180° views, allowing the player to become a Gundam mobile suit pilot. Arcades are usually equipped with 4 Gundam PODs (like this set), allowing players to take part in online battles set in the Gundam universe. In the game, players become pilots of giant robot mobile suits, which are based on the Gundam anime series. Pilots play through two battle scenarios lasting a total game time of 10 minutes. The PODs themselves are interlinked. Players can opt to launch simultaneously with their friends or with other players launching at the same time. The game POD is large and has an adjustable seat, surround sound speakers, projector screen, headset jacks, hand control sticks and foot pedals. Each POD is equipped with headset jacks for in-game communication between players (pilots may bring their own headsets. The battle scene point of view is from inside the mobile suit, the overhead projector displays three panels onto the inner dome screen about one metre away from the pilot's seat. Immerse yourself in the Gundam universe with this set of 4 Gundam PODs. The set of 4 Japanese version PODs allows players to become Gundam pilots and take part in online battles. The Gundam POD is an arcade game set created by Bandai Namco and Banpresto, released in 2006. It is a competitive team game in which the player climbs into a POD that offers 180° views, allowing the player to become a Gundam mobile suit pilot. 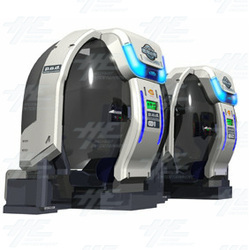 Arcades are usually equipped with 4 Gundam PODs (like this set), allowing players to take part in online battles set in the Gundam universe. In the game, players become pilots of giant robot mobile suits, which are based on the Gundam anime series. Pilots play through two battle scenarios lasting a total game time of 10 minutes. The PODs themselves are interlinked. Players can opt to launch simultaneously with their friends or with other players launching at the same time. The game POD is large and has an adjustable seat, surround sound speakers, projector screen, headset jacks, hand control sticks and foot pedals. Each POD is equipped with headset jacks for in-game communication between players (pilots may bring their own headsets. The battle scene point of view is from inside the mobile suit, the overhead projector displays three panels onto the inner dome screen about one metre away from the pilot's seat.